How did I hear about this market? As most of you know, I offer one on one consulting sessions for people interested in building their airbnb businesses, expanding their real estate profile, learning to structure their finances for early retirement, and more. Ryan*, an investor in Colorado Springs, contacted me back in July after hearing me on the Bigger Pockets Podcast. We had a lovely session where he told me about his 4 plex near the Gardens of the Gods Park which I think will be an absolute goldmine. In our chat, he mentioned that Colorado Springs is a very Airbnb friendly city (they are just happy to be collecting the taxes ) and that the neighboring tourist town of Manitou Springs, at the base of Pikes Peak, had put in very tight restrictions on short term rentals. It sounded like a wonderful opportunity for him. Now, of course I hear about new markets all the time but something stuck with me about this one. The combination of “airbnb friendly”, near-by Colorado, and an invitation to stay in his Airbnb (I always warn my friends, if you invite me out, don’t be surprised when I show up!) made it a no brainer to go out for a visit. I casually mentioned this offer to my friend Adam while we were in Maui this Winter, and he jumped on the opportunity to join me. Adam owns 3 homes in Colorado, does Airbnb on one of them, and flips furniture as his “day job”. He said that he had also heard some rumblings about Colorado Springs from other investors as it is one of the last affordable “city” markets in this state. 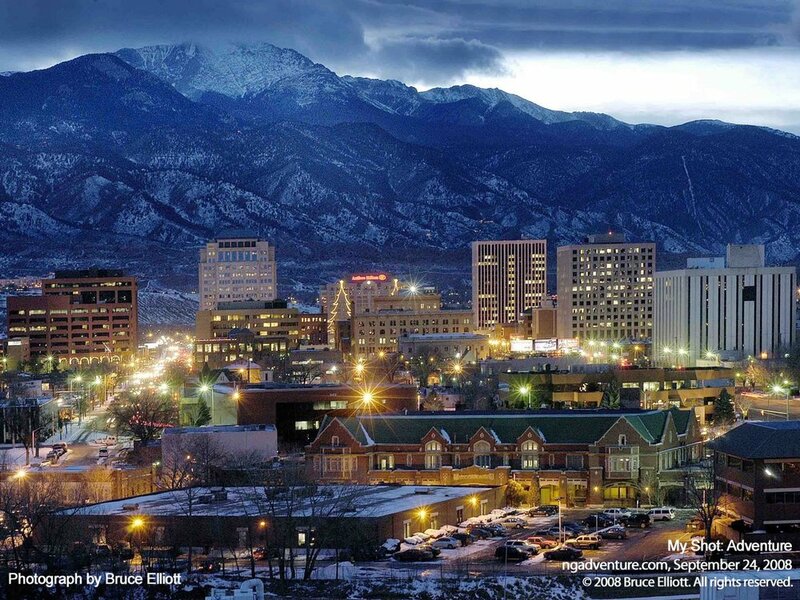 Colorado Springs has a population over 460K (Denver 680K, Boulder 100K city, 300K county) with 10K moving there annually. It’s median starter home prices near downtown are under 300K (Denver 500K, Boulder 700K). For airbnb attractability there are two huge military bases with Air Force, Naval Academy and more (think graduations), 5 colleges (range 1K-14K students), lots of outdoors attractions (Pikes Peak, Garden of the Gods), 3 hospitals, the Broadmoor hotel (historic hotel on a lake), 2 cute downtown streets with restaurants (downtown and colorado city), 90mins from Denver, and 2 hours from skiing in Breckenridge. Their airport offers direct flights to many cities via Frontier & United. We really didn’t do much before arrival. I organized our stay in Ryan and Pam’s latest listing. Adam asked his realtor in Boulder for a contact in Colorado Springs and we lucked out to get connected to Sumer Liebold of 8z, who was super knowledgeable, a real hustler, and very generous with her time. They scheduled a meeting our first day to get the lay of the land, the second and third days we reserved large blocks of times for showings. On Monday, I picked Adam up at noon and we headed to the springs. In 90mins we arrived downtown and grabbed a quick bite at a restaurant adjacent to the 8z offices. This started our culinary adventure. I was pleased to find lots of delicious food in the area, even though it felt a bit pricey. We found similar prices to Boulder, which is a much more affluent area (Denver is cheaper). We met Sumer afterwards for a thorough download of the area with maps, school districts, and city gentrification plans. Then we headed west to check into our b&b and to allow me to analyze the area to pick out of list of homes to see the following days. I settled on 17 homes. I couldn’t believe that I saw so many with potential. Although we fully intended to just look around this trip. I was very pleased to see that there were so many that could work. Of the 17 we saw, 3 of them had short term rental potential. 1 went under contract the same day we saw it, one would work but was just ok, and one was a real stand out winner. I am currently in the works to see if a purchase is possible. Adam, who was looking for something more long-term, was disappointed to find such low rents. It actually seems to be a market where is makes more sense to rent than buy if you are living there. Its nearly a break even. When I am looking for an airbnb, I usually try to find something that will work as a long term, just in case, and although I think I could make the one I am pursuing “work” long term, it’s not a slam dunk. The reason I am considering it is that I believe this will change. I feel as though there is appreciation upside and that I can get 10-20% airbnb numbers, which makes it a winning combination. We also found that most properties are zoned for 2 dwellings, meaning you can turn almost any home into a legal duplex. This makes a 240K property much more valuable and allows for many rental combination possibilities. I have bought 4 of my 5 properties in cash and love that when I use cash, I have more negotiating power, a more competitive offer (if there are multiples), and that I pay low closing costs. So, my first inclination was to try to get a hard money loan from a friend to make a low offer with a quick close. While I was shopping my deal around, two of my investor friends called me out about my resistant towards mortgages. Sure, I’m self-employed which makes the loan process more complicated and gives me more hoops to jump through, but I really need to get on the leverage train. I have decided to look at the long game (instead of focusing on added fees and the exorbitant interest over 30 years), I’ve decided to focus on all the ways my leveraged money can continue to make more money. This new perspective had me change tack towards a cash out refinance. Which means, I pay in cash for the competitive edge and then refinance so I have a mortgage and can pull the cash back out. This is a common trick that investors use, but after some research, I’ve learned it’s still not my best option. Here’s why: #1. Two closes. When I purchase the home cash, I will still be paying about 1% in closing costs; even though its a savings compared to the normal 3%, it’s still something. Then I have to pay 3% closing costs with the refi. #2. With a refi, depending on the bank, they require that at least 25% equity remains in the home, which is more than the 20% down I would put in with a regular mortgage. #3. It can take up to 6 months to qualify for a refinance. If I get this home, I’ll write more details about the process for you. For now, I am chatting up my usual partners and looking at mortgage options. This gives me even more incentive to get my taxes finished so I can qualify for a mortgage on the next home, all on my own. *Ryan offered a discount code for his online shop: code - Zeona, for 5% off.